I’m such a sucker for dark chocolate. It’s probably the one thing I could never walk away from. The bitter bite with the subtle sweetness is IMHO the perfect combo. Add some coarse salt, crunch and dried berries and then you’ve got me hooked. I’ve started making my own chocolate back a couple of years ago. 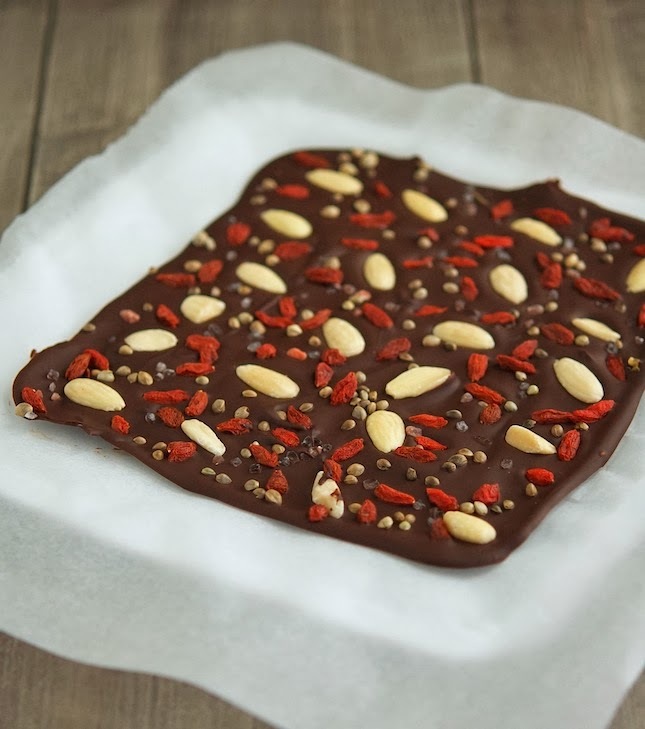 I wanted a chocolate bark with salt and almond and goji berries and hemp seeds. Yes, all of these things in one bark and (obviously) no mass market brand made it so I made my own. Easy. 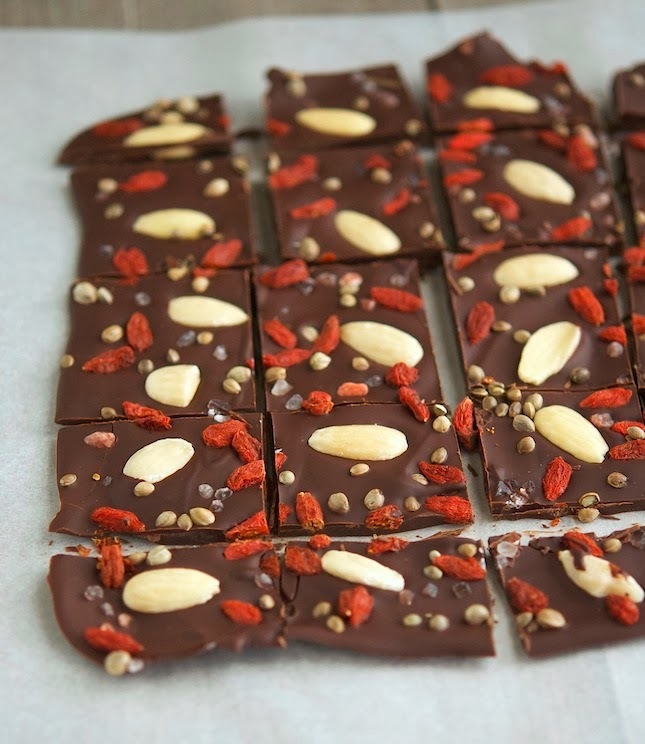 I then discovered that making your own chocolate bark at home could not be more easy. It’s the perfect treat to make for a dinner party, or you can wrap it up in some cool handmade packaging and even give it as a gift. And let me tell ya, you’ll make quite an impression when you give a homemade chocolate bark. You’ll look like a Maitre Chocolatier or something, while - in all honesty - all you did was to melt some chocolate and throw in some nuts, seeds or dried fruits. I always buy high quality dark chocolate with at 87 percentage of cocoa, but you can shoot for higher percentage (such as 90%) if you like your bark to be bitter. I really like the Himalayan pink coarse salt + almonds + goji berries + hemp seeds combo, but feel free to play around with your own favorite add-ins, and make this your own. You can use dried fruits, different nuts and seeds, spices, herbs, etc. You can really make something special every time. 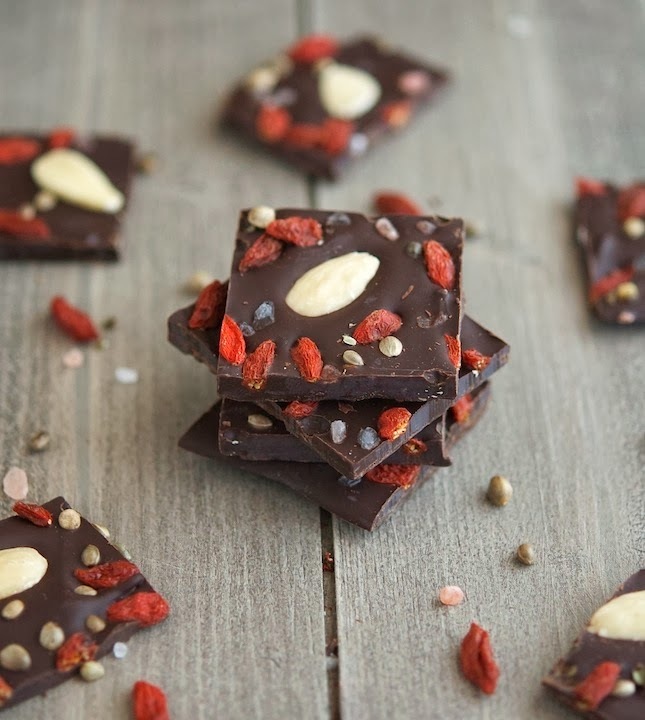 Dark chocolate, hemp seeds, goji berries, almonds...this bark is as healthy as it gets. And as long as you don’t eat it all by yourself, you’re good to go! Using a sharp knife, chop the chocolate. In a bowl set over a saucepan of gently simmering water, heat the chopped chocolate, stirring occasionally, until it is melted; do not let the bowl touch the water and do not overheat. Remove the bowl from the saucepan and stir the chocolate well. If you have a candy thermometer the temperature should registers 90°C (195°F). If you don’t have it, like me, just trust your instincts. Sprinkle with coarse sea salt. Add superfoods in an uniform pattern, making sure that each piece of bark is covered. Refrigerate the bark for about 20 minutes, until hardened. Invert the bark onto a work surface. Remove the parchment paper, break into pieces and store or serve. My oh my looks amazing!!!! This bark looks fabulous Mike! You should sell this stuff! What an awesome gift idea! I'm not sure I would actually make any money since it's so easy to make...but, who knows... Maybe I should give it a go! Oh my, I am loving this! You know how much I love dark, bitter chocolate! I need to come up with some good bark for the Holidays, too! Since you can't have Christmas without "some" kind of chocolate, you know. ;) I'm loving the Goji Berries and I think orange zest would go fabulously well with that! And almonds, too, of course! I'm curious, though... I've never seen hemp seeds with the shell on before... I usually just buy the hearts, which are very tender and creamy. Aren't they a tad too crunchy with the shell still attached? I imagine they must be a bit like sunflower seeds. Delicious without the shell, but BRUTAL when you try to chew and swallow that armor of theirs. They are quite crunchy and tbh, if you eat them by the handful it tastes like if you were munching on a rug...I know B-R-U-T-A-L.. I'm so going to make this for Christmas! Looks amazing! 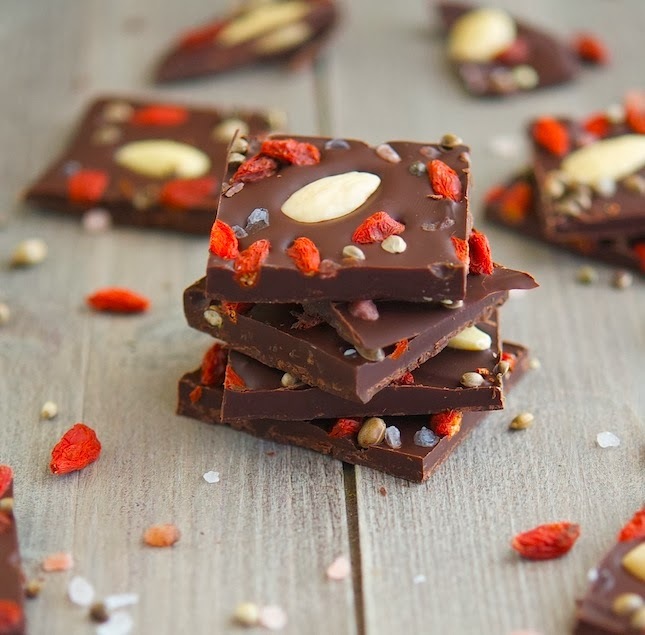 I love a good bit of chocolate bark but have never thought to put it with superfoods. It looks so delicious!